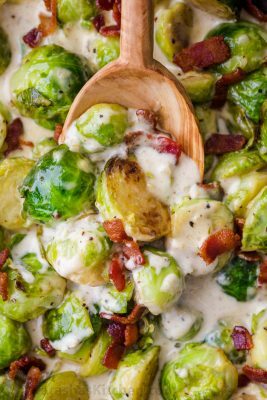 Brussels Sprouts in a creamy parmesan garlic alfredo sauce topped with crisp bacon. Quick and easy, holiday-worthy side dish that comes together in one-pan! Place a large deep skillet or dutch oven or medium heat. Add 6 oz chopped bacon and cook until browed. Remove bacon to a plate, keeping 3 Tbsp of bacon fat in the pan. Add trimmed and halved brussels sprouts and season with season with 1/2 tsp salt and 1/4 tsp black pepper. Cover and stir occasionally 8-9 min or until tender and lightly browned. Add minced garlic and stir 1 minute until fragrant. Add 1 1/2 cups heavy cream and bring to a simmer. Stir in 1 Tbsp lemon juice then sprinkle the top with 1/3 cup parmesan cheese and stir to combine and season to taste (I added another 1/4 tsp salt). Bring just to a simmer then remove from heat and serve garnished with reserved bacon.